Is Gun Violence Due To Dangerous People Or Dangerous Guns? : 13.7: Cosmos And Culture The killings of two journalists in Virginia last week have reignited a national conversation on mass shootings and gun control. Tania Lombrozo looks at some research and what it might mean for policy. 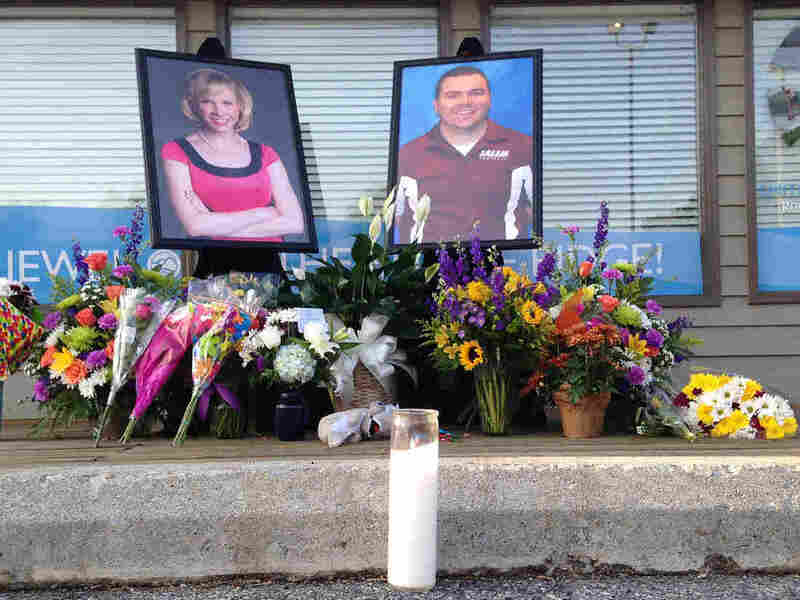 A candle burns in front of a memorial for two slain journalists, Alison Parker and Adam Ward. Some point to dangerous people. In an interview with CNN, the father of one of the journalists who was murdered last week called for "sensible laws so that crazy people can't get guns." In a radio interview after the shooting, Sen. John McCain argued that the government needs to identify people who are mentally ill and more effectively keep them from obtaining guns. Others point to dangerous guns. In an interview in the wake of last week's shootings, a survivor of the 2007 Virginia Tech massacre highlighted America's unusually easy access to hazardous firearms: "We don't have a monopoly on people disgruntled at work or people suffering from mental illness. What we do have is unique accessibility to dangerous firearms that we allow in this country to exist." Last year, President Obama suggested that the U.S. follow Australia's example by adopting a strict ban on semi-automatic and automatic weapons. Australia hasn't had a mass shooting since it enacted the legislation in 1996. (Editor's note at 8 a.m. on Sept. 15, 2015: See update below.) Meanwhile, by some counts, America has had a mass shooting approximately every two weeks, with 2015 being the most deadly year yet. Framing the debate in terms of people versus guns isn't just a matter of emphasis. The National Rifle Association, for example, has typically gone for the former approach, which cuts against the idea that ownership of dangerous guns should be restricted for all people. Instead, the group calls for a national database to better track "lunatics" who shouldn't buy guns. On the other hand, mental health professionals worry about the impact of emphasizing mental illness as a causal factor in mass shootings, which could — to quote an article by David Crary — lead to "setbacks to their efforts to de-stigmatize mental illness." Putting issues of effective prevention aside, emphasizing dangerous people versus guns could have a real impact on people's attitudes toward gun control and toward the mentally ill. A nationally representative survey with 1,797 respondents, conducted in 2012 and reported in a 2013 paper published in the American Journal of Psychiatry, set out to investigate precisely this issue.
" 'With more than 65,000 Americans shot in an attack last year, we have to do something to keep guns out of the hands of dangerous people,' said Kim Jones, the spokesperson for the group. One proposal currently being considered by Congress is a good start, Jones said. Congress is considering legislation to require states to enter people with serious mental illness into a background check system used by gun dealers to identify people prohibited from buying guns, or face a penalty. According to Kim Jones, 'Getting this law in place is one way to protect the public from dangerous people.' "
" 'With more than 65,000 Americans shot in an attack last year, we have to do something to keep dangerous guns off our streets,' said Kim Jones, the spokesperson for the group. One proposal currently being considered by Congress is a good start, Jones said. Congress is considering legislation to ban large ammunition clips, which are military-style high-capacity magazines that can shoot 30, 50, or 100 bullets without requiring the shooter to stop and reload. According to Kim Jones, 'Getting this law in place is one way to protect the public from dangerous guns.' "
The researchers were interested not only in whether reading these different news stories would influence people's views about appropriate gun legislation, but also whether they would have different implications for people's attitudes toward the mentally ill. Overall, they found that hearing any of the news stories about the mass shooting increased support for a ban on the sale of high-capacity gun magazines and had a negative impact in respondents' attitudes toward the mentally ill: They were less willing to have a person with serious mental illness start working closely with them on a job, and they were less willing to have a person with serious mental illness as a neighbor. But the news stories with different emphases weren't equivalent in their effects: Those who read the news story that emphasized dangerous guns supported a ban on high-capacity gun magazines more strongly. The two texts did not, however, have significantly different effects when it came to attitudes toward the mentally ill or gun restrictions for people with serious mental illness. This could be because the baseline levels of support for gun restrictions for people with serious mental illness were already high across the board: More than 70 percent of the respondents who didn't read any of the news stories supported increasing federal funding to enable such restrictions. The researchers also suggested more subtle ways in which an emphasis on dangerous people over dangerous guns could alter attitudes toward policy. Previous research has found, for example, that people are more likely to support policy efforts when they hold society — not isolated individuals — responsible for the issue the policy aims to address. "By focusing respondents' attention on serious mental illness as a causal factor," the authors write, "messages about gun restrictions for persons with serious mental illness may lead the public to see mass shootings as isolated events, perpetrated by a small group of individuals, which gun control policy cannot prevent." In fact, Pew polling data collected shortly after the mass shooting in Newtown, Conn., in 2012 found that Americans are split when it comes to their beliefs concerning the root causes of mass shootings: 44 percent said they are "just the isolated acts of troubled individuals"; 47 percent indicated that they "reflect broader problems in society." Whether those broader problems concern gun regulation, our mental health system, or both, these findings suggest we might do well to shift our focus entirely. If it isn't just a matter of dangerous people or dangerous guns, but of dangerous structural problems at the level of society, that makes all of us responsible. Since the publishing of this post, there has been debate as to whether Australia has had a mass shooting since it enacted legislation in 1996 to ban semiautomatic and automatic weapons. The discussion centers on three events in Australia that resulted in multiple victims, though they did not involve guns commonly called assault-style weapons. First, some background: The definition of a "mass shooting" is not set. In the U.S., for example, a "mass killing" is defined by federal law. There must be three or more deaths and it cannot be a domestic incident — for instance, one family member killing others. But there is no set definition of a "mass shooting." Two people were killed and five others were wounded during a 2002 shooting at Monash University in Melbourne. Reports from the time were that four of the five people wounded had been shot. Three people from one family were killed and two others (a boy from the family and a police officer who responded to the scene) were wounded by gunfire during a 2011 incident at a home in Hectorville. The gunman was a neighbor of the three people who died. In 2014, a farmer in the small town of Lockhart shot and killed his wife and three children before killing himself.